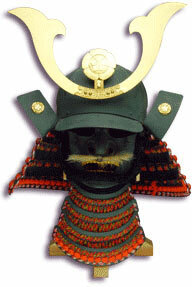 Oda Nobunaga Helmet for sale is a museum quality replica. These popular helmets are designed like the Kabuto worn by the famous samurai Oda Nobunaga and are crafted to honor his military accomplishments. Helmets like these were worn by ancient Japanese warriors and are considered a vital part of traditional Japanese armor worn by the samurai. 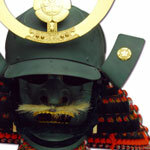 The Oda Nobunaga Helmet is crafted in China and features an antiqued battle green colored metal. They have gold plated accents and are decorated with real horse hair. These battle helmets are full size and wearable. They have a leather lining and a neck protector that has a colorful cloth embellishment. 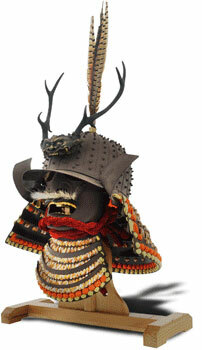 These authentic samurai helmets include a custom designed display stand. They are crafted of steel and weigh 7 pounds 8 ounces. Buy the authentically styled historically accurate Oda Nobunaga Helmets for only $399.99. Date Masamune Helmet for sale is a museum quality replica. These popular helmets are designed like the Kabuto worn by the famous samurai Date Masamune, who was known as the one-eyed dragon. 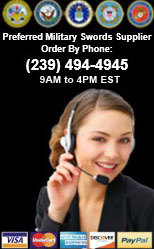 They feature the crescent moon shape and are made in China. They are an antiqued charcoal gray color steel with gold plated accents and real horse hair. These battle helmets are full size and wearable. They have a leather lining and a neck protector that has a colorful cloth embellishment. 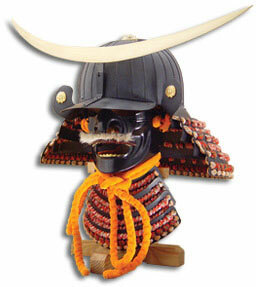 These authentic samurai helmets include a custom designed display stand. They are crafted of steel and weigh 7 pounds 8 ounces. Buy the authentically styled historically accurate Date Masamune Samurai Helmets for only $439.99. 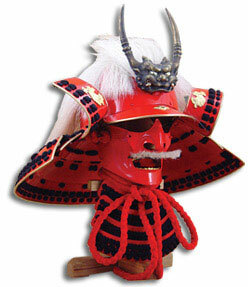 Daisho Kake Japanese Samurai Helmet for sale is a museum quality replica. These popular helmets are designed like Kabuto worn by ancient Japanese warriors and are considered a vital part of traditional Japanese armor worn by the samurai. They are embellished with real quail feathers and real horse hair and crafted of antiqued autumn brown colored steel. These battle helmets are full size and wearable with a leather lining and a cloth neck protector. These authentic samurai helmets include a custom designed display stand. They weigh 7 pounds 8 ounces. Buy the authentically styled Daisho Kake Japanese Samurai Helmet for only $439.99. 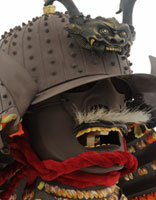 Takeda Shingen Helmets for sale is a museum quality replica. These popular helmets are designed like the Kabuto worn by the famous samurai Takeda Shingen and are crafted to honor his military prowess. 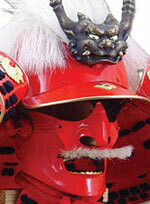 Helmets like these were worn by ancient Japanese warriors and are considered a vital part of traditional Japanese armor worn by the samurai. The Takeda Shingen Helmet is crafted in China and features red finished metal with brass trim and dragon medallions. It is decorated with real horse hair. These battle helmets are full size and wearable. They have a leather lining and a neck protector that has a colorful cloth embellishment. 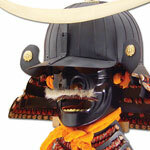 These authentic samurai helmets include a custom designed display stand. They are crafted of steel and weigh 7 pounds 8 ounces. 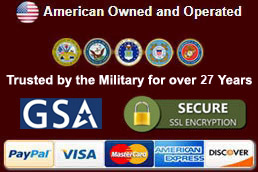 Buy the authentically styled historically accurate Takeda Shingden Helmets for only $439.99.